MisterHope.com – Illustrator, Beard Wearer, Pencil Wizard. Queen Watevra Wanabi wishes you a Happy Love Day. I hear you say ‘I want to colour my own in’, well my friends, click the black and white version for a printable Queen. I also drew a Lego Batman with his new Apocalypseburg outfit! I’ll try and find the inks to upload a colourable version of that too! And here’s a link to the Hachette page about the book! <-Click! AAAAAAAAAAAAAAAND finally, a link to the Amazon preorder. It’s worth mentioning, that Hachette Heroes (the publisher of the book) is French, so the book will be published in French initially with a possible English translation soon! But buy it for the pictures…and with photo translation on smart phones now, you can read it in ANY LANGUAGE! 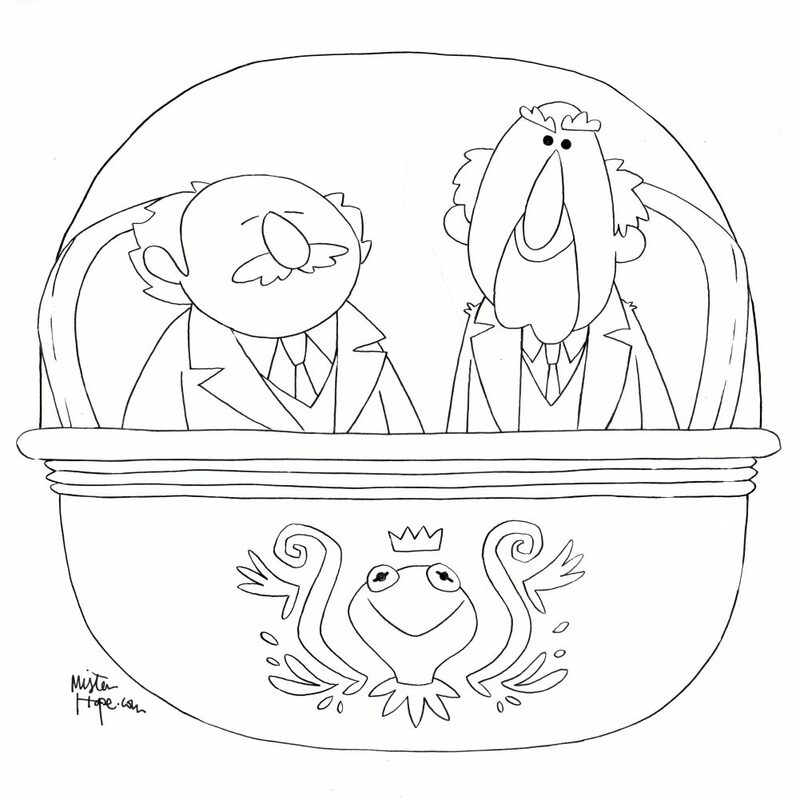 Statler and Waldorf are the best. It’s tough to draw Muppets because they’re already so stylised it’s sometimes difficult to capture the essence of the character while retaining an art style. I think i did alright here! Please download the colouring page and add your own colour! I’d love to see it…tag me on twitter @misterhpe or Instagram @misterhope! I’ll make a post containing all the colouring pages i receive! As i recently managed to get tickets for The Muppets (LIVE SHOW!) at the O2 arena, this will be the first of many Muppet pictures while i try and contain my excitement! So here marks the first of hopefully many updates about the latest project i am working on. Thomas Olivri (of Geek-Art.net) and I are currently working on a bestiary of monsters and creatures. The book will include monsters from movies and tv shows but will also include myths and legends too! Although i can’t share too much, I recently finished a basilisk for the book and took photos of progress. So there you have it. Keep an eye out for future posts teasing the new book, but i am so excited for everyone to see it!